A few posts ago, I was asked what we were going to do this year for a China free Christmas. At that time I wasn't sure just what my kids wanted. I knew Caylee wanted a weight vest for fire training, so we ordered her one made in the USA. But I wasn't sure what Melissa or George wanted. Then one day my spouse called from work and asked me to ask the kids if they'd rather a Wii or a horse for Christmas. 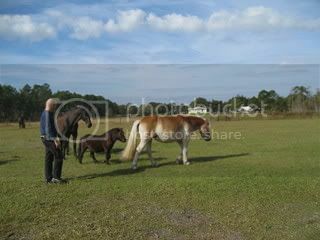 He had seen an add for two horses that needed a new home and was considering getting them if the kids were interested. The kids said, "Horses, of course, we have enough video games!" 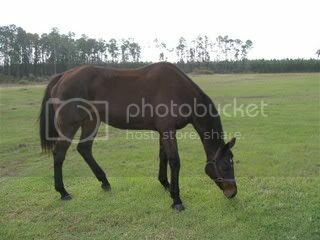 and Beauty a Thoroughbred who needs some tender loving care to get some weight back on her. The kids want to rename her as Beauty was the nickname the previous owner called her by but they feel that the story of Black Beauty is too sad to ever use that name on any horse. 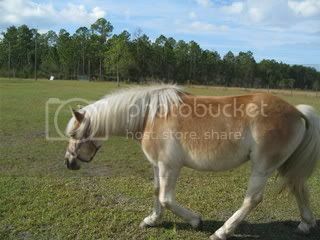 Besides, this horse is bay not black. Here's a picture of Madeye in between the new mares. He is infatuated with Honey. Madeye's one & a half years old and 29" tall. Lucky, our American Standard, is so thrilled to have some more friends his size! He's been so sad since Bria passed away. Now we have three riding horses again and with the pony cart, we'll be able to go out riding as a family! If Santa's extra kind, or we find more horses in need of a loving home, we'll adopt two more so everyone has a mount and Grandma can drive the pony cart.